Nikolai Krymov vividly demonstrates his style and his vision, it would seem, such an ordinary and unremarkable village, and village life. In fact, this is due solely to the fact that, by himself, the artist is a vivid representative of a city dweller, so he could see the natural beauty of nature that his predecessors could not notice. In the painting “Noon” the viewer has the opportunity to consider the beauty of the countryside. We see a village house next to which stands some kind of building, which apparently is a shed or utility room. There is a woman standing near this utility room; she is a little hunched over and does her own thing. On the banks of the river, which is almost completely surrounded the possessions of an elderly couple. Grandfather sits by the river and apparently fishes. At a distance there are large willows that hang down their branches down to the water. The artist is not without reason that he uses such faded colors in order to highlight the sun, which is at its zenith. In the reflection of the sun in the water, it is clearly visible that it is located at the very top. Through the use of yellowish shades, the master successfully conveys the whole atmosphere. In the background you can see fields that are also completely covered with sunny color and yellowish tint. The trees themselves and the rest of the greens, has a fairly large number of different shades of green. 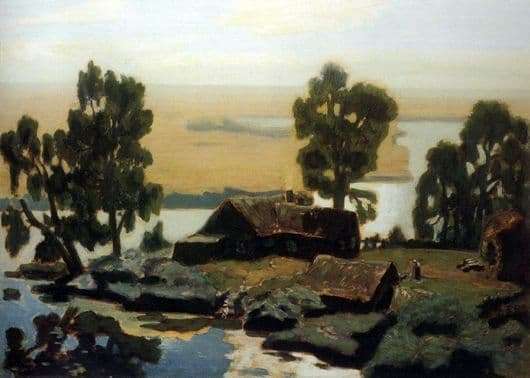 The master very well conveys the atmosphere of a hot day, all due to the same effects, because of which mighty willows stretch towards the water and the slowness of the whole picture, which speaks about the scorching sun, but despite this, the canvas is full of energy and vitality.